Click Here to read Chapter One of Filled Up, Poured Out: How God's Spirit Can Revive Your Passion and Purpose. Note: Though this first chapter is geared primarily to pastors and church leaders, the rest of the book is geared to every person who desires to follow Christ. 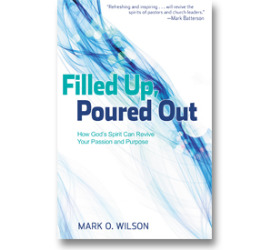 A review of Filled Up, Poured Out by Paul Wilkinson at Thinking Out Loud.